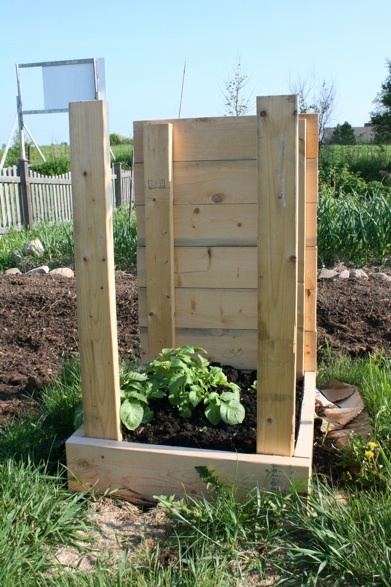 Last month I built my first potato tower, filled it with 6″ of compost, and planted it with a variety of spuds. Now 4 weeks in, 2 of the plants are up and running, and the other 6 are finally breaking ground. Unfortunately, due to my dog digging through the tower after I planted it, I cannot say for certain which plants are doing better, but I would guess its the earlies (Yukon and Kennebec). I have done one small “hilling” when I added an inch of worm castings a week ago. Yesterday I added about 3″ of soil to cover the two more vigorous plants and next weekend will add the next row of side boards and fill it with another rich soil mix (1:1:1 compost, soil, worm castings). I am considering building an 8′ version of this to push the productivity of the backyard a bit – we do have some unused space along a fence line or two.I still have 150#’s of spuds to get in at the market farm (another 50#’s going in today) so seed is not a problem. Even if I only net 15:1 pounds in harvest, it will be worth it to be able to condense the plantings to this degree. The 8 pieces in this tower would have taken over 20 sq feet of space, so from a harvest per sq foot perspective I am already at a 500% improvement even if I only get 8 lbs of spuds, as I a only using 4 square feet in the tower. For sub acre agriculture, where success is measured more in harvest per foot, this is huge. All in all its a fun expirement for the summer! That’s awesome! 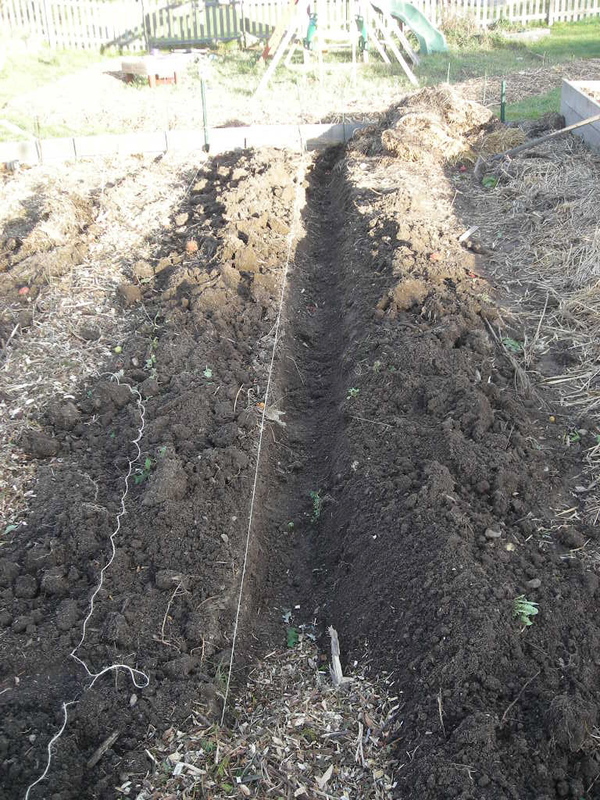 I am planting potatoes for the first time this year, in a regular old hill method, since space is not an issue for me. I just covered over the plants yesterday, but I hadn’t let them get as big as the ones in your pictures. Mine were only about three inches above the ground. Should I let the plants get bigger before I cover them? Its more of an art – I waited a bit longer on the big ones as I want the other plants to catch up. the kicker is to not over more than half the top growth at once and to not over do it as you need the leaf area to produce sugars for the tubers. I try to get 4-6″ of top growth and then hill in half of that every few weeks for the first 50 days or so. At the farm I plant in trenches and as I weed the mounds of soil the wheel hoe pushes the soil into the potato plants as I go. That is about as scientific as I got last year. Hi Rob. Thanks for the pics and thinking. I wonder what the cost/benefit situation is with the lumber? It looks to be pine or some other softwood to me, which would not last a season here before needing to be replaced. Do you think that the starting layer for the tower should have a mixture of soil mulch sand etc to give it a well drain look? Seems that some of the problems encounter by others has been damp rotting potatoes. The pine will only be in contact with the soil for 4 months of the year, and is 2″ thick. Hoping for 2-4 seasons in our climate- it is half the price of cedar – though in Cedar you will need to drop down to 5/4 decking rather than 2x lumber. Coating it with linseed oil may help too, but you need to ensure that it is pure and not mixed with mineral spirits. Have you ever considering hilling them just after planting ? That is the method my brother and I used to plant at my mothers garden last year for her 500 + feet row of potato. and save some times later in the season. 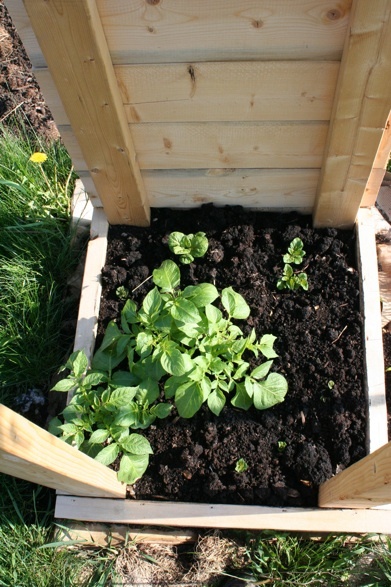 It works very well, she just weed them a few times before the potato were big enough to take over the weeds. For next year planting, you might want to try to grow a few couple of row under cover, I am sure that an early planting of potato in mid April in Wisconsin can not be that bad if they are protected with row cover. you know the joy of early potato, think about it when they come in June …. I have three bins started, two with Bintjes (which is a late variety) and one with Salem (which is mid-season). The earlies went into two short rows in my beds. It’s the first time I grow potatoes (or anything for that matter), so I’m very curious. One problem I foresee is that the bins might not get enough sunlight – only 4 hours a day… Thanks for your updates, it helps to compare progress! Bryan- The durability of the pine depends on your climate. I have raised beds made out of 2x10s, and after three years there is no appreciable rot even though the inside surface is in contact with the soil all the time. I live in southern Michigan, so it’s moderately wet, but it usually dries out between rains and we don’t have termites or anything. Seems like one tower per variety might be the optimal strategy so that you don’t have to deal with varying heights when it comes time to add depth and a new board (as you force them upward). I am planning on using cedar boards from a fence that a neighbor tore down, so I hope to have good endurance. I should have enough boards to do three or four towers, so I will try three or four varieties of seed potatoes, one per tower. Awesome! I am trying this! Thanks for the tips Xavier. Katrien, are the towers only getting 4 hours of daylight due to where they are located, or because the sides are too high? I agree that 4 hours is not enough – I try to keep the sides built just flush with soil level and in a location that gets sun 80% of the day. Good luck! We tried tire piled potatoes at the last house and one of them was fantastic – the other gave absolutely nothing. No idea why, just one of those things. I have to say that your towers look much superior and I’m thinking that next season we will have to try this, (Getting to the serious part of winter round here!). MAN! These things are insanely vigorous in such rich soil! I had to put on the second “rung” today as the two larger plants put on another 3″ since this post – that is over an inch a day! Walker nailed it – one variety per tower is the way to go… the other plants are somewhere between 3″ and 6″ vs the Power Twins 12″. Had to laugh at the dog disturbance. Having two terriers myself has presented a lot of design challenges. Thanks for the simple tower. I don’t see how it fastens though, do you just nail the boards up as you go? I think I’ll try this, but am thinking I’ll assemble each 4″ frame separately and then slide them over the posts to stack on each other for ease of stacking and unstacking the tower. Might create some gaps due to the softwood warping though…guess I’ll have to experiment. Chris, I’ve built two more since this one and fenced them to keep out our mutt. The bottom run got 4 3″ deck screws per board and each additional run gets 2 screws per board. With a cordless screw gun it takes all of a minute or so, and makes taking it apart a breeze. I have my towers, and the taters are doing awesome. They are on my boyfriends property, and I don’t get there often. Since the last visit, they have sprung up. Do I need to remove the leaves on the part of the stem I will be covering with new soil, or does it matter? The Berta Rotary Plow, a love story.